'Willmottiana Alba'. 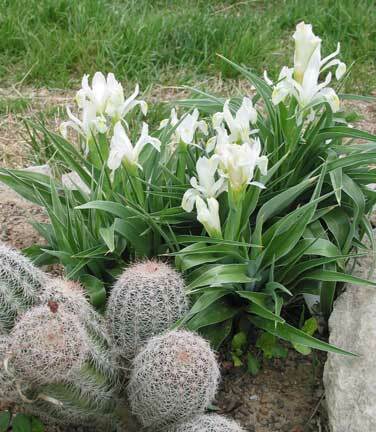 (Van Tubergen, R. 1936) Subgenus Scorpiris, (Juno); Color Code-WW; "This charming white iris with a yellow blotch and delicate green tracery on each fall is a gem for the rockery or for grouping in the low border. A profuse bloomer with each stem bearing 8 or 9 blooms. About 10 inches high. "-Walter Marx Gardens 1951. "The standards are white with no markings. The falls are white with green markings on either side of the yellow center keel. Height 1 ft. to 15 inches. A strong growing variety with deep glossy almost blue green foliage"-Neel (1951). Van Tubergen 1936; 1938; Stewart 1939. This plant in horticulture is probably a white form of Iris bucharica " Introduced by Tubergen; flowers pure white, from the leaf-axils." "syn. Iris bucharica Foster, var. alba Hort. ; Iris willmottiana Foster, var. alba Hort. "-SIGNA p. 1734. Counted by Simonet as 2n=21.